Some time back, the blog examined the television series The Name of the Game, about a publishing empire. 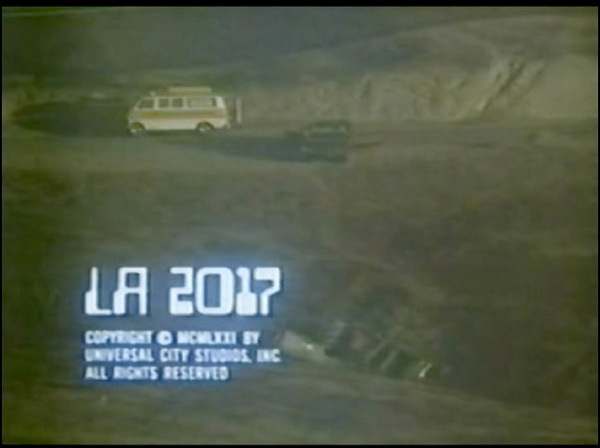 It’s now appropriate to take a look at the show’s most unusual episode: LA 2017, a dystopian tale about, what seemed in 1971, a far-off year in the future. It was also one of the early directing credits for Steven Spielberg. LA 2017 originally aired Jan. 15, 1971, less than a month after the director’s 24th birthday. The Name of the Game tackled current events as experienced by key personnel at Howard Publications, headed by Glenn Howard (Gene Barry). For LA 2017, the production team decided to address the environment — but in a way the series hadn’t previously attempted. Producer Dean Hargrove commissioned a script by science fiction writer Philip Wylie. As the episode begins, Glenn Howard is driving in Southern California. The publisher is planning a campaign across his magazines to highlight environmental issues. As Howard drives, he uses a tape recorder to dictate a letter to the president. “Priorities have to be established or this may very well be the beginning of the end for Earth as we know it,” he says. Howard has an accident, and ends up in a ditch. He also, seemingly, is now in 2017. An ecological disaster has forced people to live underground. National governments have been replaced by corporate ones. Despite being a CEO, Glenn Howard doesn’t like what he sees and sides with those resisting the corporate order. The episode eventually ends with it being revealed that it (probably) was a dream. Spielberg’s last shot is of a dead bird. presumably not to let the audience off too easily. The episode’s title card, primary actors and the writer, producer and director credits are in a font used a lot at that time because it seemed futuristic. Wylie turned the story into a novel, Los Angeles: A.D. 2017. He died late in 1971 at the age of 69. Spielberg’s career, meanwhile, was still gearing up.